The painting, Detroit-born artist Miguel “Belozro” Yeoman’s original work “The Rebuild,” depicts three futuristic laborers representing Ford, Chrysler & GM triangulated around the globe, working together. Miguel and his business partner James Feagin, Head of Marketing and Strategic Management for BeloZro Visual Energy have teamed up with Jerry Paffendorf of Loveland Technologies for the project. Jerry Paffendorf’s previous successful crowdfunding projects include raising over $67,000 to build a statue of Robocop. They are using the crowdfunding platform Loudsauce.com, a website similar to Kickstarter which allows donors to contribute amounts as little as a dollar to causes and projects they support. Contributors to the project can receive rewards for funding the project ranging from their name listed on the website ImagineDetroitTogether.org to a t-shirt depicting the image. Top level donors a can even have their picture or company logo placed on the billboard to signify their level of contribution. The San Fransisco based loudsauce.com focuses on ‘amplifying ideas that matter” by securing major media outlets such as billboards, television commercials, and bus signs at a discount to broadcast the messages of successful projects. 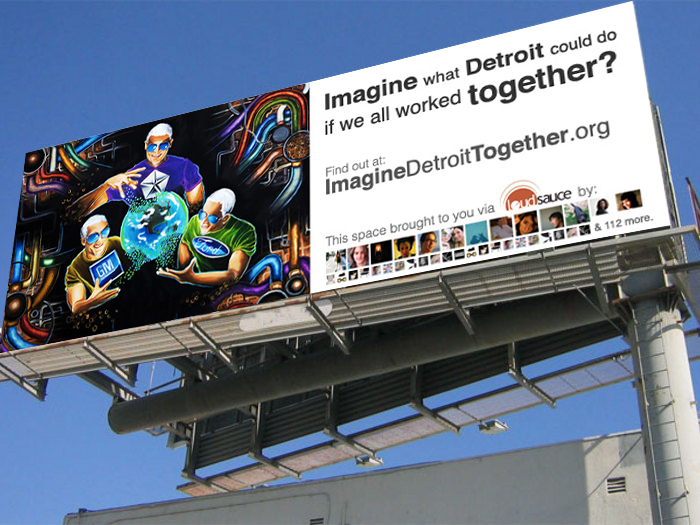 The billboard project, titled “Challenge people to think big about Detroit’s future via a billboard” has raised over $500 of it’s $3,500 goal in less than a week, and expects to announce several large contributions in the next few days. Interested donors can find the project’s Loudsauce campaign page: www.ImagineDetroitTogether.org. BeloZro Visual Energy, founded in May 2011 by James Feagin and Miguel “BeloZro” Yeoman, promotes and manages the brand featuring t-shirts and other merchandise based on the original artwork of BeloZro.